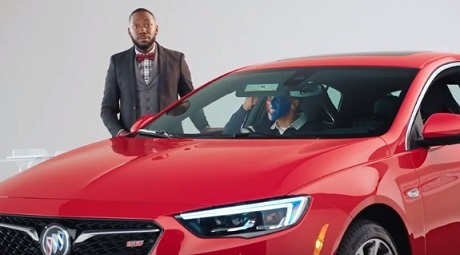 New Girl’s Lamorne Morris is “The Dean” of Fandom University in the new March Madness-themed ad campaign launched by Buick. The actor/comedian, who got this “job” earlier this year, in February, stars in a series of ads for the brand, teaching viewers some lessons on being the ultimate fan this March Madness season. During the first class, “Color Theory”, Morris shares the theory of supporting your team colors. “But, don’t get too close to the eyes. It can sting,” he tells a fan sitting in the passenger seat of a Buick Regal GS Sedan, whose face is painted half red, half blue and concludes that it does sting if he gets too close to the eyes. During the Fan Lesson #2, Morris shares a fan psychology tip on how to keep your peace of mind this March Madness with the First-Ever Buick TourX wagon, and during the lesson #3, “Culinary Arts”, he advises students to “always bring an unreasonable amount of food” when tailgating and remember that “presention is key”. The ads showcase the All-New Buick Regal lineup, which includes the All-New Buick Regal GS Sedan (msrp starting at $39,070), boasting “racing-inspired design” and “heart-racing performance” thanks to its massaging, heated and ventilated GS-exclusive front sport seats, 310-hp V6 engine, intelligent All-Wheel Drive with active twin clutch, Interactive Drive Control, and Brembo front brakes, and other features that ensure an “exhilarating driving experience”, the First-Ever Regal TourX Wagon (msrp starting at $29,070), described as “the perfect partner for adventure with standard intelligent All-Wheel Drive with active twin clutch, versatile cargo capabilities and integrated roof rails with available crossbars” and the All-New 2018 Buick Enclave mid-size luxury SUV (msrp starting at $39,995), described as “Tomorrow’s SUV for Today’s Family”, which features 3.6L V6 SIDI VVT engine, keyless Open and Push Button Start, available built-in Wi-Fi hotspot, the Buick Infotainment System, and more.